We are pleased that the global consensus has been reached to launch an international standard for energy management system (EnMS). ISO 50001:2011, the first edition was released on 15th June 2011. We would like to congratulate and give our utmost respect to the ISO organization, PC242 and associated members involved in launching the standard as a result of their invaluable inputs with their time and effort. Energy management has always been a part of ISO 14001, the international standard for environmental management system only if the person concerned wished to have energy management as one of the clauses in the requirements. Energy management, for superior energy performance, for better energy efficiency and for reducing a significant cost related to energy indeed promotes positive aspect of environmental impact. It is an interesting phenomenon that when there is a drive for compliance for requirements, people tend to make more effort in erasing negative impacts rather than enhancing positive impacts. For this reason, it is an inevitable outcome to have ISO 50001 the stand alone EnMS. ISO 50001 will enhance our improvement motive and skill in our business operation on account of energy related operation. Terminology "energy" often leads us into believe it is more an engineering issue. Especially when talking about energy efficiency, we tend to focus attention on more efficient facilities, renewable energy, non-fossil energy etc. We, as business executers need to switch our mind a bit to focus on invisible living creature running around in our daily lives, energy!! All our business in general is to generate energy, energy to pursue happiness, comfort, sense of achievement, security and so on. Energy management throughout the supply chain is to manage the input of energy that is treated and processed with energy to output another source of energy to maintain the business flow. Ultimate winner in the business is to produce the highest quality output on account of the least consumption of energy. This is true for any businesses from the primary to service industry, and is true for us consumers running our daily businesses. Energy management therefore is operational processes to develop business to the optimum scale sustaining its drive in the fast changing environment. Energy management is actually the business issue. Systematic approach in energy management with the baseline ISO 50001 provides opportunity for any business units to run their business aiming to gain the most energy efficient operation with continual improvement practice leading into the best sustainable business development and performance. 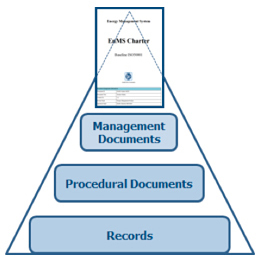 The first step is to establish the document "EnMS Charter" for which guideline and provisions are defined to implement and maintain EnMS in accordance with ISO50001 requirements as the baseline. 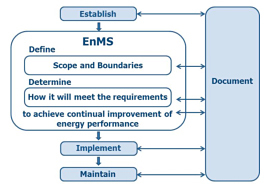 In the charter, the framework of EnMS and the scope and boundary for EnMS operation shall be defined. The top management is committed to provide resources for establishing the EnMS organisation with operational role and responsibility based on the defined scope. Many organisations recognise the importance of having a document management system to be integrated with EnMS in order to demonstrate how the operation will meet the requirements of ISO50001. The heart of ISO50001 certification is to certify that you have thoroughly documented the way that organisations do things, and that organisations' workers actually do things in the way that was documented. This means the documentation plays the most important role in ISO50001 certification process. Establishing sound documents and the proper control of documents are essential in order for maintaining, communicating and further improving the management systems with all people involved. The guideline and provisions defined in the charter document should address proper handling of documents including defined structure and procedures as EnMS documentation.